It may seem like a challenge, but Hallquist has a record of meeting them. The challenges she’s faced previously have included running a utility that was on the verge of bankruptcy, bringing it back to financial health while greatly increasing its use of renewable energy sources and winning recognition for innovation — and coming out as transgender at age 59. 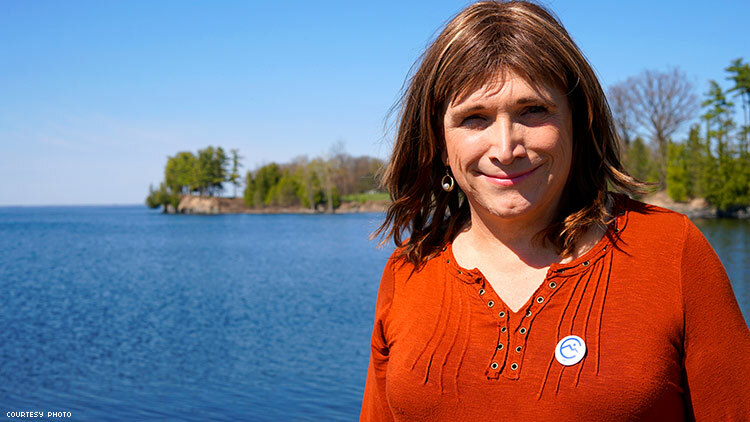 That was three years ago, when Hallquist was still CEO of the Vermont Electric Cooperative, making her the first business leader in the U.S. to transition while on the job, and this year she set her sights on becoming the nation’s first transgender governor. She decided to run for governor, she tells The Advocate, because Vermont, despite its strong progressive reputation, is “in the middle of an identity crisis.” It has always been a state where people have come together despite their differences to solve problems, but that’s changed under Gov. Phil Scott, she says. Scott this year vetoed two budgets because of disputes over school funding and other issues, and in late June he finally allowed a budget bill to become law without his signature, avoiding a government shutdown when the new fiscal year began July 1. In his two years in office, he’s vetoed a record number of bills, Hallquist says, including measures to raise the minimum wage and to require employers to offer paid family leave. One of Hallquist’s top priorities as governor, she says, would be addressing the high rate of rural poverty in Vermont. She’d like to see every home and business in the state connected with fiber-optic cable, which would increase internet speed and boost rural economic development. She favors raising the minimum wage to $15 an hour, enacting paid family leave, working toward single-payer health care, and revamping the school funding structure, while resisting efforts to privatize schools and instead assure every child receives a quality public education. She also would address climate change — “My goal in life was essentially to solve climate change,” she says. The electric coop gets 96 percent of its energy needs from renewable sources, and she wants to see the state in general make progress in this regard. Hallquist, who is also strongly pro-union and pro-reproductive rights — she’s endorsed by Vote Pro-Choice as well as the LGBTQ Victory Fund — has been involved in civic life in Vermont ever since moving there from northern New York State in 1976. She has been a town meeting moderator and a school board member, in addition to service on boards dealing with mental health services and economic development. She joined the Vermont Electric Coop in 1998 as an engineering and technology consultant, then rose through the ranks to become CEO in 2005 after it acquired the assets of a larger investor-owned utility. Given her high profile, her transition was fairly big news in the state in 2015. Hallquist began planning for it 10 years earlier, she says. She and her wife, Pat, had agreed at one point that Christine’s true gender identity was a secret she would take to her grave, but she found she couldn’t do it. When she started having thoughts of suicide, she knew she had to do something. She also felt guilty about keeping her secret from her three children. “I couldn’t go to my grave without telling that truth,” she says. She and her wife saw a counselor for three years to prepare them for telling the children. She prepared the fellow Vermont CEOs with whom she meets regularly. And she prepared herself. About three years before her transition, Hallquist met Mara Keisling, founder and executive director of the National Center for Transgender Equality. She asked Keisling what would be the most important thing to do for trans people. Keisling replied, “Be successful.” That’s advice Hallquist has taken to heart. Vermont holds its primary August 14.